The majority of disabled people, whether service users or not, are unlikely to know that this event is taking place. The fact it is ‘about them’ rather than an event seeking to involve them perhaps gives us the clearest message yet regarding the utter disregard the Coalition government has for the rights of disabled people. Sadly, with the shadow spokesperson on disability issues also participating in this patronising farce, it would seem we have a tri-partisan approach to displaying disabled people and service provision in the brave new ‘market place’. Every aspect of this National Disabilities Conference stink to high heaven – ideologically and politically – it adds insult to injury by stealing the language and concepts of the Disabled People’s Movement and transforming them into tools that will assist in the dismantling of the Welfare State. On the agenda are issues such as employment, independent living and disability hate crime, however, none of these subjects are likely to be discussed in the context of current government policies; policies that have contributed to disabled workers losing jobs, done nothing to challenge disabling barriers in the labour market, resulted in claimants losing benefits and many severely impaired people having their services reduced or removed. How can there be a discussion on independent living against a backdrop of the closure of the Independent Living Fund? How can people listen to a presentation on Disability Hate Crime and not round upon the role played by the Department of Works and Pensions in feeding material to fuel the ‘scroungers’ agenda? The answer is these issues will be discussed in terms of ‘opportunities’ – providing workfare programmes, making money by providing services within the voluntary and private sectors or increasing marketization in the public sector. Since the mid-1990s we have seen the development of Janus politics where disability charities, parts of the voluntary sector and certain disabled people’s organisations have launched a new Disability Movement that speaks of rights on the one hand, whilst seeking to serve the neoliberal agenda on the other. The NDC is populated by individuals and organisations who want to foster the Big Society and buy a piece of the action as the services are hived off – it is an auction and disabled people’s lives will be placed under the hammer. Nothing about us – without us! This event will provide delegates with the opportunity to debate and discuss the key issues around supporting disabled people across the UK. With key speakers, high level policy makers & drivers and important stakeholders present, this event is one not to be missed. Can you imagine the shock among disabled people who have come across this Conference and its agenda? Disabled activists fighting the austerity measures and promoting disability politics are being encouraged to take a stand against this Conference because it upholds everything the Disabled People’s Movement has fought against for the last forty years. The NDC 2013 epitomises the very essence of Janus politics by employing a dependency model approach to those sick and disabled people cast in the role of ‘deserving of care’ and a phoney ‘rights approach’ to those considered ‘lazy and workshy’ – in the words of Iain Duncan Smith, “….a hand up and not a hand out.” The Conference therefore can be seen as a watershed; it sets out the market stall for future government policies and draws a line in the sand vis-à-vis any progressive steps towards inclusive practices or the equalisation of opportunities for disabled people. It is time to say enough is enough to this sheer hypocrisy; time to defend our struggle for emancipation against the patronising service providers who seek to exploit us and keep us dependent upon them; now is the time to demand Esther McVey sticks her disablist policies where the sun fails to shine! There will be those who will fail to see what the fuss is all about; it is only a conference. The truth is the NDC is more than a conference; it is the first glimpse of a route map that will take us away from building an inclusive society and towards further marketisation, social exclusion, poverty and greater exploitation of both disabled people and those who work alongside them. It is vital to see this conference as yet another ideological and political attack on disabled people’s rights and welfare. We cannot afford to how the NDC to go ahead unchallenged. Bob Williams-Findlay, co-founder of Disabled People Against Cuts and member of the Social Work Action Network steering committee. What is a Grand Committee and what does it mean for Welfare Reform? After all the fuss of the Welfare Reform Bill in the house of lords yesterday I wasn’t expecting much for a couple of weeks when it will reach committee stage. However, I woke up today to find that the government had tabled a motion in the lords to send the bill to the grand committee, held in a side room. Any Bill can be referred to a Committee of the whole House but the procedure is normally reserved for finance Bills and other important, controversial legislation. Detailed line by line examination of the separate parts (clauses and schedules) of the Bill takes place during committee stage. Any Member of the Lords can take part. Committee stage can last for one or two days to eight or more. It usually starts no fewer than two weeks after the second reading. The day before committee stage starts, amendments are published in a Marshalled List – in which all the amendments are placed in order. Amendments on related subjects are grouped together and a list (“groupings of amendments”) is published on the day. What happens at committee stage? Every clause of the Bill has to be agreed to and votes on the amendments can take place. All proposed amendments (proposals for change) can be discussed and there is no time limit – or guillotine – on discussion of amendments. What happens after committee stage? If the Bill has been amended it is reprinted with all the agreed amendments. At the end of committee stage, the Bill moves to report stage for further examination. The proceedings are identical to those in a Committee of the Whole House except that no votes may take place. In the House of Lords the committee stage of a Bill usually takes place in the Lords Chamber and any Member can take part. The Committee may choose to vote on any amendment and all Members present can vote. So you can see, apart from being in a less-accessible room, with space for far fewer peers to discuss the bill and no public gallery, sending a bill to the Grand Committee also means that the amendments cannot be voted on individually. I think, on the whole, this can be viewed as a bad thing. Even worse, though; in the Committee Of The Whole Chamber, voting on amendments would enable a majority vote to fix some of the worse points. Instead, the Grand Committee must agree unanimously on an amendment which means that just one person siding with the government can block any attempt to fix this bill. However, please keep sending your messages to peers. They have noticed our objections, and we can’t let up now. Details are on my blog. 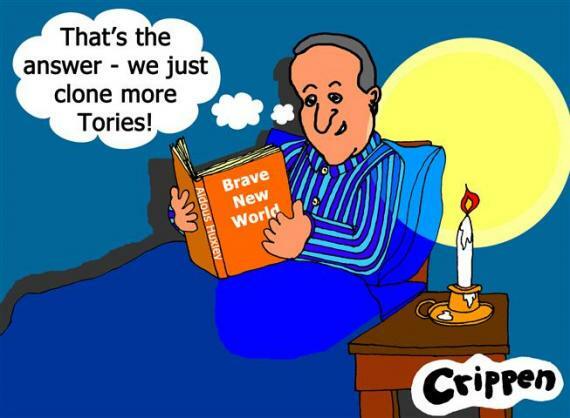 Crippen : The big society? !